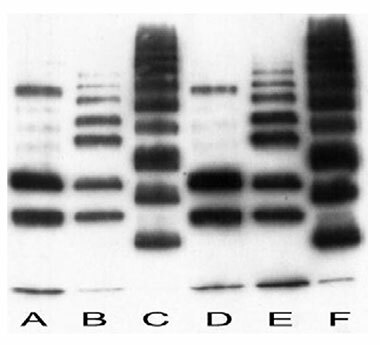 Figure 1: Western blot of multi-ubiquitin chains using MAb to Polyubiquitinylated Conjugates (FK1) (Prod. No. BML-PW8805) (lanes A-C) and MAb to Mono- and Polyubiquitinylated Conjugates (FK2) (Prod. No. BML-PW8810) (lanes D-F). Lanes A & D: K48-linked chains.Lanes B & E: K29-linked chains. Lanes C & F: K63-linked chains.